applicants may get the application for KLA Recruitment vacancies from the web portal www.kla.kar.gov.in. Application form for the above posts with the necessary documents to be reached before 30-12-2017. Mode of Application submission is through offline. Selection of candidates for this KLA recruitment Sweeper, Dalayat, Junior Assistant, Library Assistant jobs is based on written exam/ Personal Interview. 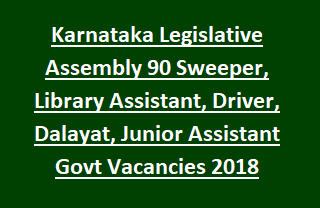 Karnataka Legislative Assembly Recruitment 90 Sweeper, Junior Assistant, Library Assistant, Dalayat, Driver Jobs notification dates, Available vacancies, Age limits, Selection Process details are mentioned below. Available vacancies in Karnataka Legislative Assembly KLA Recruitment are 90 posts. -Junior Library Assistant: 02 posts. Sweeper: Must have passed 4th class. Dalayat: must have passed 7th class. Driver: Must have passed 7th class and having driving license with 3 years driving experience. Junior Assistant, Library Assistant: Candidate must have Computer knowledge and Library Science qualification. For more qualification details see the KLA notification. Upper age limit for general candidates is 35 years and for Cat 2A, 2B, 3A, 3B candidates is 38 years and for Cat I, SC/ ST candidates is 40 years. Please check the KLA notification for Salary details. Application fee for KLA vacancies is Rs. 100/- to be deposit through IPO. Candidate must have attach this IPO with the application form. Candidates will be selected for KLA Vacancies based on written exam/ Interview held by Karnataka Legislative Assembly Selection Committee. Interested/ Eligible candidates are required to apply for this KLA recruitment vacancies before 30-12-2017. Download the application form for the above posts using the KLA official web portal http://www.kla.kar.nic.in/. See the notification for more details.